Shinsuke is a famous little joint, and obviously knows it. It doesn't make the slightest effort to advertise itself, and the little wooden sign with its name in katakana hanging next to its door is just a formality: you have to know it's there to find it. I was introduced to the place by a new friend of mine who, having lived around Ueno for the past few decades, knows it very well, and he told me that recently the English language Tokyojin has published a list of its favorite Nomiyas. Shinsuke was the only one in Bunkyo-ku honored by the paper with a few lines. I was expecting a lively place full of people and smelling of fish and oil, but Shinsuke isn't like that: a little classier and a good deal quieter than the average izakaya, it is nonetheless basically the same thing. Sure, the food costs way more, and portion are way smaller, but basically it's the same glorified thing: sushi, fried, boiled and grilled fish, sunomono, and so on. Sure, it's 80 years old, and sure, it has a tradition, but I wasn't very impressed and I don't share Tokyo Q's enthusiasm for the place. It's too sterile for my character, too expensive for what it offers and I don't think I will be going again any time soon. I can have the same things somewhere else with a more interesting menu. If you do want to go, first eat something at the nearest Mac Donald's, or you will go to bed either broke or hungry. Where it is : get out of JR's Okachimachi station and turn left. Follow Kasuga Dori for about 300 meters and you will find Shinsuke before a Shinto temple. Remember that the sign is small, only in Katakana and not easy to see. Hantei is an extremely beautiful and traditionally stylish Japanese building whose construction predates WWII and the Great 1922 Tokyo Earthquake. The few buildings spared by the fire that day in the Low City were mostly around Ueno, and the three story house that is now Hantei is one of them. For this reason and its intrinsic beauty it has been deservedly declared a National Treasure. The interior is even more stunning than the outside, also because it's been superbly kept and renewed. It's a pleasure to be there, and you can eat at any of its three stories as you wish. You will have to speak Japanese. The food, as everything else here, is very elegant, from the tiny cubes of avocado jelly to the carefully arranged miso paste. There is no menu, you just start getting skewers of always changing composition and this goes on until you have had enough. 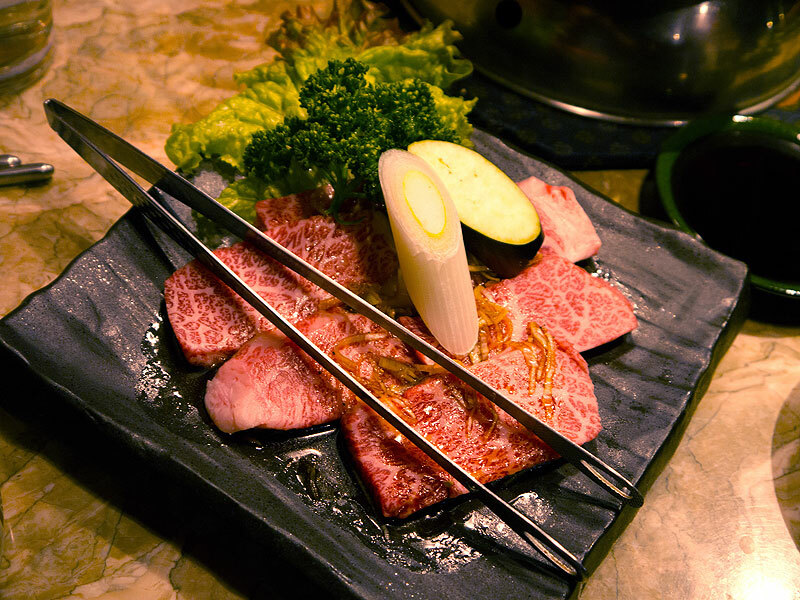 Hantei is more a place to drink than to eat, and it's not particularly cheap. Still, to be what it is it's reasonably priced and definitely worth a visit. It's a few meters from Chiyoda line's Sendagi station Exit. Basically, only maguro is served in this restaurant. 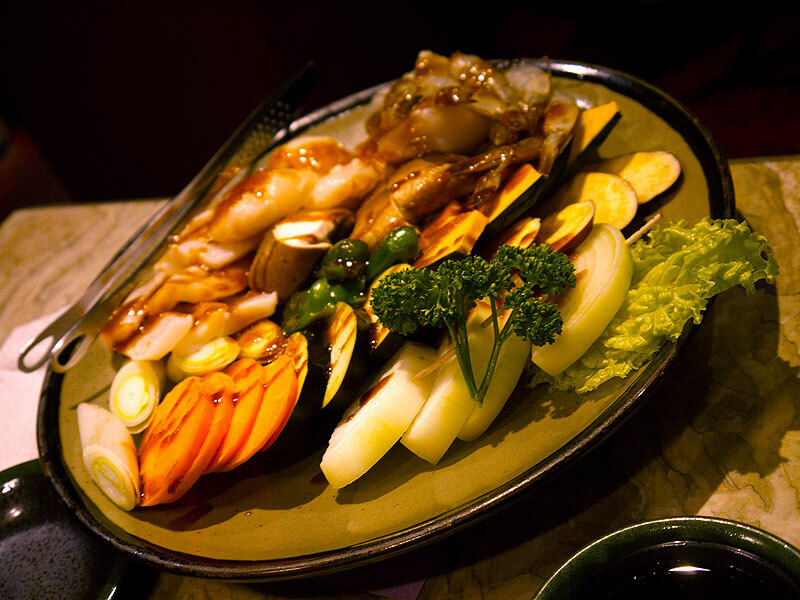 But whether is it grilled, boiled, sauté, in soup, as sushi or sashimi, it is just plainly excellent. This address is strongly recommended if you want to enjoy some really nice maguro, and escape from the usually limited selection of tuna you find in most izakaya and restaurant. It is also a good opportunity to learn more about the use of this fish in Japanese cooking. 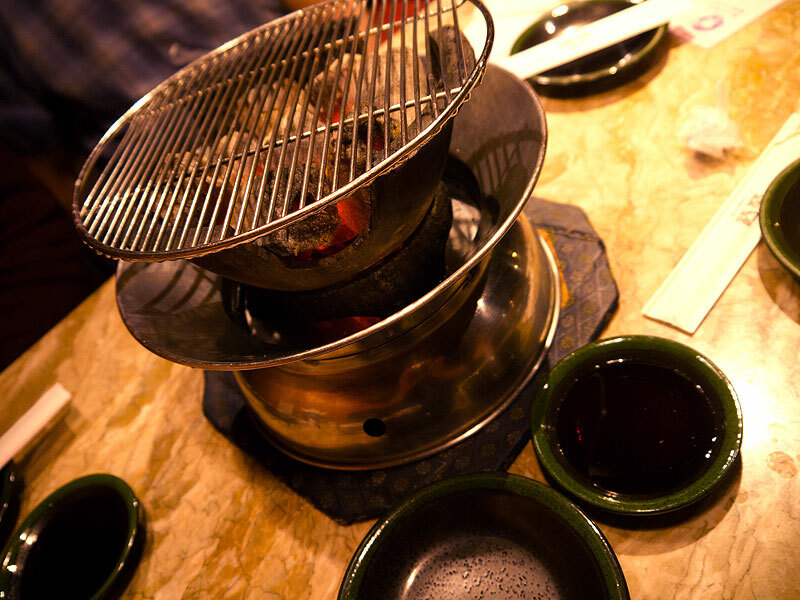 Really nice yakiniku restaurant in Ueno - few meters from Shin-Okachimachi station, 10 minutes walk from Ueno Station. They have english menu. 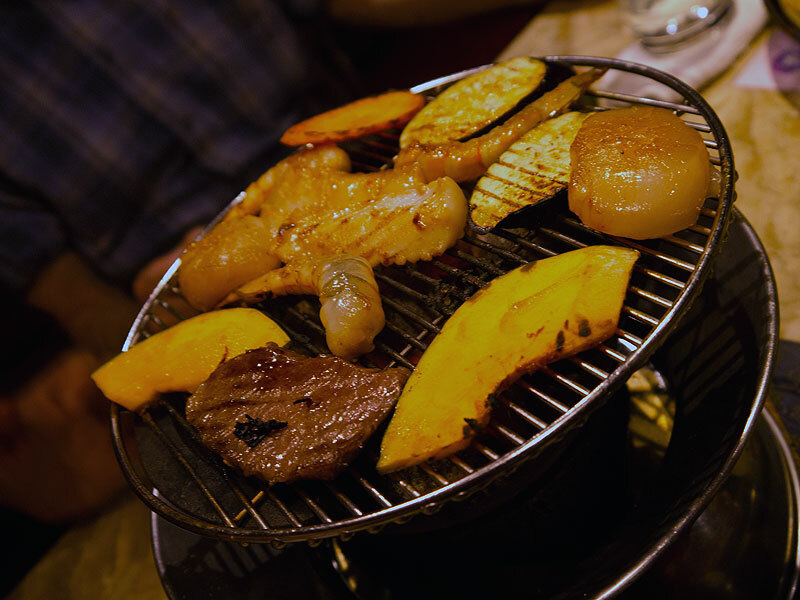 A few moments and you have a grill ready on your table. Girls choose a seafood set - this is for two persons. I prefer a japanese beef. Sour is a choice for girls. 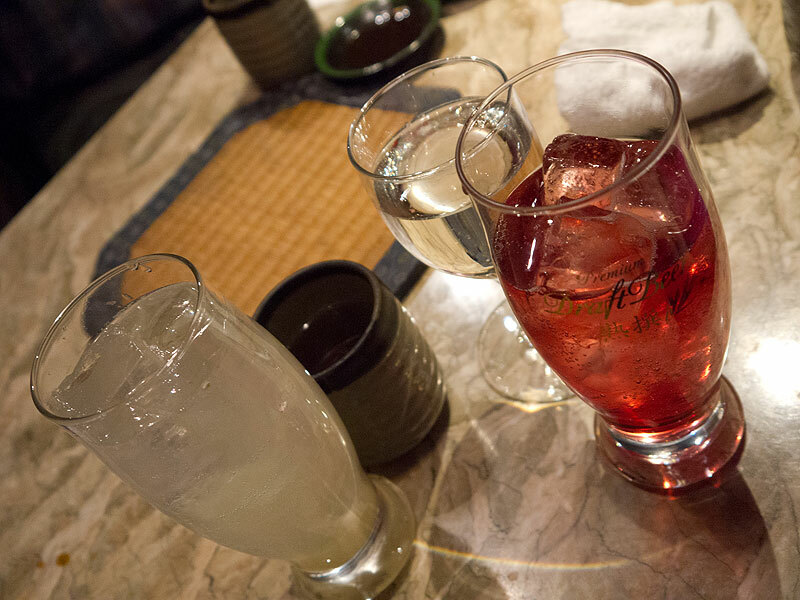 They also have a sparkling sake - interesting thing. Boys prefer sake this evening.